Netflix is leaning hard into the holidays this year, releasing a veritable slew of yuletide content to distract you from the fact that nobody roasts chestnuts over an open fire anymore. The streamer got Kurt Russell, of all people, to don a snowy white beard for its upcoming The Christmas Chronicles, which lands on November 22. And then there’s the anticipated (?) sequel to the ultra-memeable A Christmas Prince arriving the following week. And if you prefer your holiday fare with a side of Satan? Well, Netflix has announced a bonus, Christmas-themed episode of Chilling Adventures of Sabrina. 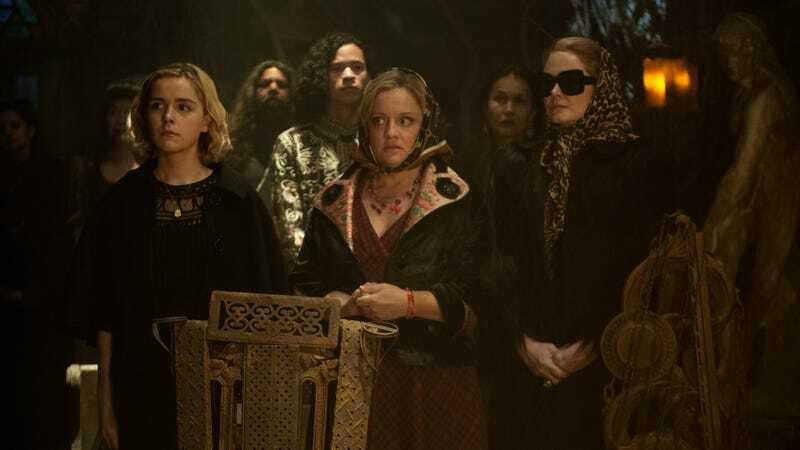 Subscribers can unwrap the episode on December 14, when Chilling Adventures of Sabrina: A Midwinter’s Tale will add a new wrinkle Kiernan Shipka’s witchery. A press release reveals that the episode will revolve around the Church of Night’s annual celebration of the Winter Solstice. There, “families gather around the Yule Fire to sing pagan carols and tell ghost stories … [and] you never know what might come down the chimney.” Is it Grýla, the Icelandic Christmas witch? One can only dream. As Vulture points out, the episode is actually the 11th of the 20 episodes Netflix ordered when it greenlit the series. That means nine more episodes are currently in production and likely to drop sometime next year. Color us excited for them; as our coverage demonstrates, we’re very much under its spell.